Pontoon Blackjack is one of the many variations of a Blackjack game. There are two versions of Pontoon Blackjack. Australian version is mostly known as Spanish 21, and the other one is UK version. In UK Pontoon the dealer has to hit the soft 17, which is an advantage for the players, because it improves their chances for winning. Getting the Pontoon is the same thing as getting the Blackjack - 21. One of the most important differences between Blackjack and Pontoon is stand. When playing Pontoon, you have to have at least 15 to be allowed to stand, other ways you have to hit the card. Another very important difference is that the dealer's cards are both faced down, and that's why the strategy for the game is altered. When you push with the dealer, in regular Blackjack you tie and get your wagers back. In Pontoon, if you push, you lose. Unlike in Blackjack, in Pontoon all the players have a chance to beat the dealers natural 21 - the dealers don't check their cards until the players are finished with their cards. If they manage to collect 21, they will beat the dealer. After doubling down, the players can still hit their hand. 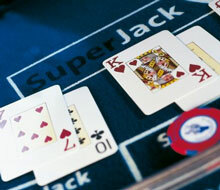 In regular Blackjack you can have only one card after doubling down. In Pontoon, you can hit again, if you want to. However, you can double down only once. Like in some other versions of Blackjack, there is a rule of five cards, here called "five card trick". If you have five cards without being busted, your payout odds are 2:1. Players' hands can be split two times, with the exception of AA situation. If the player gets two Aces, he can split only once, and there is additional rule here - he can get only one card for each of those hands. Applying optimal strategies in Pontoon can reduce the house edge to 0,40%. That's why you can get pretty good results playing Pontoon. Thanks to the fact you can beat the dealer's natural Blackjack and the possibility for 2:1 winning for collecting 5 cards, your odds are quite good, in spite the tie rule of the fact you cannot see the dealer's cards, not even one of them.